Thayne-san, today we’re going to visit Habutae Dango near Nippori Station. 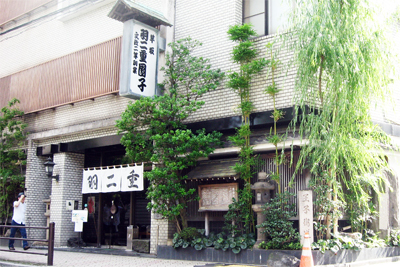 This is a dango shop that was founded in 1805, a time when the late Edo Period culture of the merchant classes had reached full maturity. Good evening Thayne-san, Concierge-san. I’m Sawano, of Habutae Dango. Please come in! Wow, the outside of your shop is beautiful, but there’s a lovely inner garden visible from the entrance! The shop is blanketed in green, making it feel like you’re in a cafe in the middle of a forest. 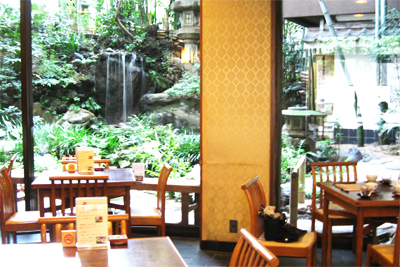 The green inner garden and the cafe area retain much of the Edo character. Calligraphy painted by Tayama Katai. A wakizashi sword left by a Shogitai soldier during the Boshin War. The Shogitai hid in the shop while fleeing enemies. Thank you. The residence of Kaga (of the Maeda clan) was located in this area starting in the Edo Period. It’s a beautiful place, with the clear water of the Otonashi River flowing through it, and the rich people of Edo competed to build country houses here as well. 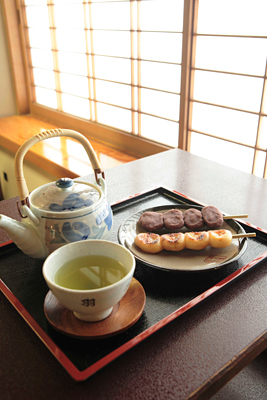 The first generation owner of Habutae Dango was a gardener, and he designed the perfect garden for customers to enjoy while relaxing with a cup of tea. 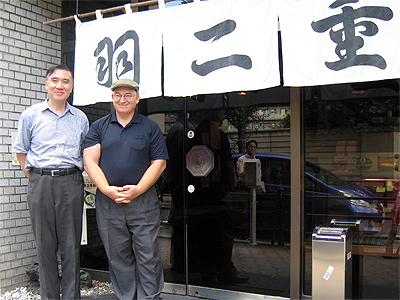 In fact, the shop was originally called “Fuji-no-ki Chaya,” or “Wisteria Tea Shop.” But before he knew it, the dango became more popular than the beauty of the garden, just like an old Japanese saying goes. You know dango must have been a popular food for the expression “Dango before flowers,” to catch on. And your shop has been doing very well ever since! Thayne-san, Habutae Dango has appeared in a lot of different works by famous novelists and poets. That’s true. In Natsume Soseki’s novel I am a Cat, one of the characters says, “Let’s go. To Ueno, say? Shall we have dango at imozaka?” “Dango at Imozaka” refers to our dango. Other authors and poets who have mentioned us in their novels, essays and haiku include Izumi Kyoka, Kubota Mantaro, Masaoka Shiki, Funahashi Seiichi, and Shiba Ryotaro. Mmm, delicious! Has your recipe changed much since the old days? We make use of machines here and there, but basically our process hasn’t changed. We use only select rice flour, which we knead with oil, steam, and then pound. There’s not much to it. Our shop’s rule has been, “If other shops pound their dough 300 times, we have to pound ours 600 times!” By pounding the dough thoroughly, the texture becomes very fine, and takes on a sticky, chewy quality. We take that round ball of dough and press it down by hand to make it flat, and then attach them to a skewer. This much of the process has to be done by hand. It’s nice that you have two types: the koshian red bean paste dango and the grilled dango with soy sauce. You can eat a lot without getting tired of them. Indeed. Please, help yourself to seconds and thirds. In the past, everyone ate three of four skewers of dango, but these days many customers say that even two skewers is too many, so we’ve started offering skewers with only two dango each. Although in the Edo Period dango shops were too numerous to count, these days there are just a few left. That’s why I believe that dango, with its wonderful taste and ability to arouse nostalgia in Japanese, are something we have to pass on to future generations, along with the Edo Period-atmosphere of the shop. Have you thought about offering other products, in addition to Habutae dango? Is that one of your family precepts? It is. One is to do business with one product, and not to mess around with other things. Another is to be early to bed and early to rise. It seems like he wanted you to focus on your day-to-day work. Habutae dango, and especially the grilled dango with fresh soy sauce, don’t last more than a day. We could probably technically make them last three or four days, but we don’t want to do that. The taste just isn’t the same after the first day. So if we want to keep the taste of our dango up to high standards, in reality we can’t very well expand our business into other products. Although your philosophy may not follow Western business models for growth, you have a wonderful shop with an amazing history. Thank you. Please, take your time and relax before you go. Thanks so much for your time today.